Benders are excited to support Millsons Vending’s in their very first, custom printed paper cup! Millsons are introducing their own design to reinforce the acknowledged quality of their drinks sources. Millsons are also incorporating the BRITA brand within the design, the perfect opportunity to promote the drink quality, highlighting the importance of water in the taste of the final drink. Their bespoke print has been developed into a mixed sleeve design, four separate designs which contain the same colours but with their own unique pattern, the simplicity of these designs oozes with quality. Millsons are a long established vending business and a member of AVS. 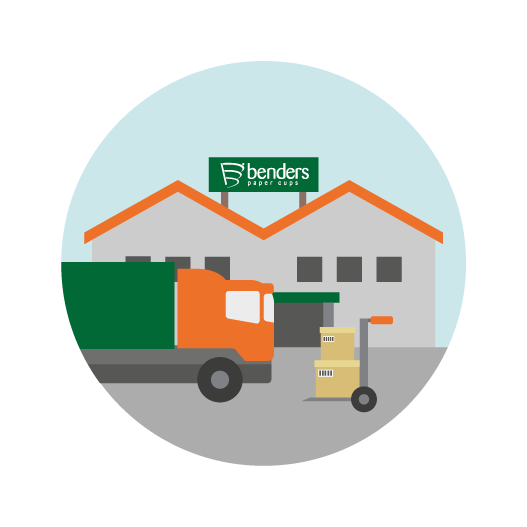 They have been using paper cups to endorse the quality of their drinks for a number of years, so as they move to custom print, Benders’ print capability and support make them the natural partner in creating the joint branded Millsons/BRITA cups. These cups were also BRITA’s first joint branding production. Les Pearce at BRITA said, “The production of these cups will hopefully increase the coffee consumption from these machines as their customers will recognise the BRITA brand from the number of retail products on the market and associate it with quality”. BRITA is also very pleased to support the Millsons custom print, to highlight the often overlooked importance of water quality in delivering a great tasting drink. 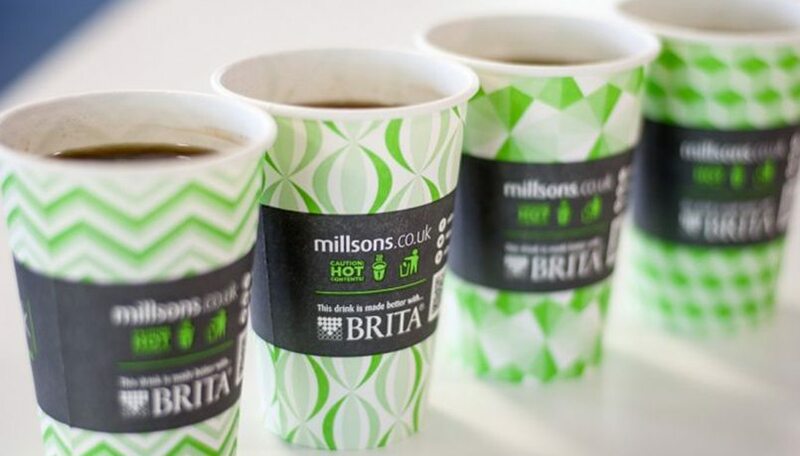 Hugh Millson from Millsons advised, “We wanted to move to our own brand of cups, and also add a brand such as BRITA on the print, indicating that we work with companies that help us supply the best quality beverage to our consumers”. This custom print highlights the migration from quick to quality in vending, consumers now expect the same gourmet coffee experience from coffee shops to the drinks they have from a vending machine. Millsons have really set a trend with this jointly branded custom print, as there is no end to the benefits they will reap from it, from the increase in beverage sales, increased loyalty to the BRITA brand to the satisfaction their customer receives knowing the cups they are using are environmentally friendly.